INTRODUCTION: This is the second of three DC TV Reviews. Enjoy! OVERALL: Just watch the My Favorite Trailer below. The joy and fun in that clip is still in the show. I sometimes think of it as a “happy Arrow“. It is a multiracial cast with fun characters and a great look. POINTS: Good show – so well done. 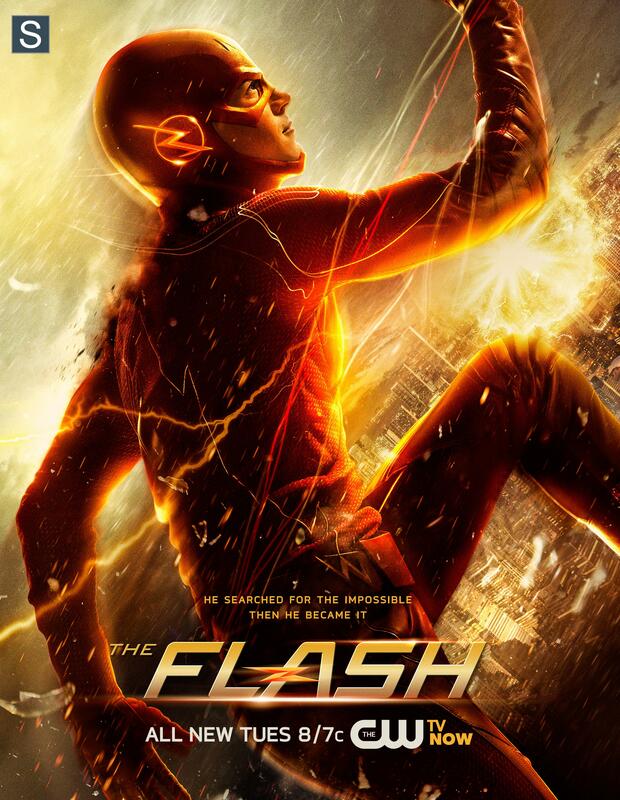 Once again, like in Arrow, the show centers around one character Barry Allen perfectly played by Grant Gustin. Yes this is, like Arrow, an ensemble show, but Mr. Gustin, a PERFECT Barry Allen, brings joy that seems to shine through every scene even when he is not there. The rest of the cast are excellent too. Also: I REALLY LOVE that Barry’s adopted family is African-American. Love it! Oh and I also like the “fast streaks” that appear in on screen to show Barry, the Flash’s running. The speed scenes are just fun. PITFALLS: Well it would be nice if the characters would stop being so awkward about romantic relationships. However, well it is also understandable. I just get tired of awkward loveness being a plot bit. FEMALE CHARACTER(S): We have two main female characters: Iris West (Candice Patton) is Barry’s adopted sister. Part of me thinks she is just there to be a “pretty girl” but she is also a journalist and has a sense of self and I think she will grow to being a powerful character on her own. Caitlin Snow (Danielle Panabaker) is the Geeky scientist of the group or rather the woman Geeky scientist. She is an interesting character and I am looking forward to seeing how she grows. CULTURAL PITFALL(S): I would like to see more women on the show. That’s about it. HIGH POINT(S): Mr. Gustin’s portrayal of Barry. He has such charm and joy on the screen. I really like it. That’s why I dub this the “happy Arrow.” This show never seems to bog down in misery and I like that. BECHDEL TEST (Website): 1 of to 3 of 3. The show tends to be more 1 or 2 of 3 but the heroines are still good. RACIAL BECHDEL TEST (Website): 3 of 3. Hooray! Barry’s adopted family is African-American. YES!